Kui (pronounced kwee) is the name of a small town in the middle of Bole district, just east of Tinga. In the past, it would have been home to a few hundred farmers and it would have been nothing to write home about. But in the last five years, it has exploded in population and has become a focal point on the debate around Galamsey. Galamsey is the act of gold mining (in this case, illegally), which can be either be done at surface or underground. It has become rampant in the district. Towns like Cloth and others to the south are also becoming quite well know for similar work and will soon be of a similar fate as Kui. The journey to Kui starts at Tinga. 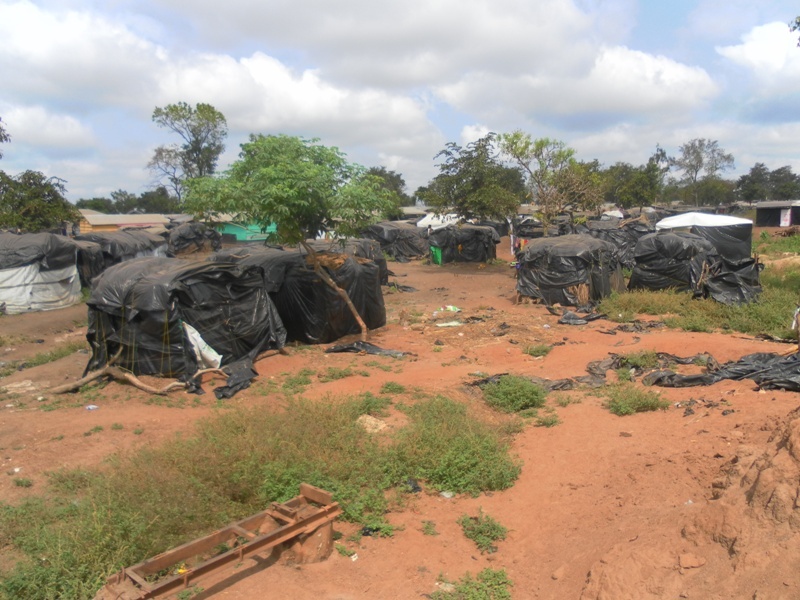 It is one of the larger towns in Bole district with over 10,000 people within its limits. The dirt road leading to Kui is treacherous Not only for the poor quality that can lead to accidents or break downs, but also for routine armed robbery. Luckily, I did not encounter either fate. 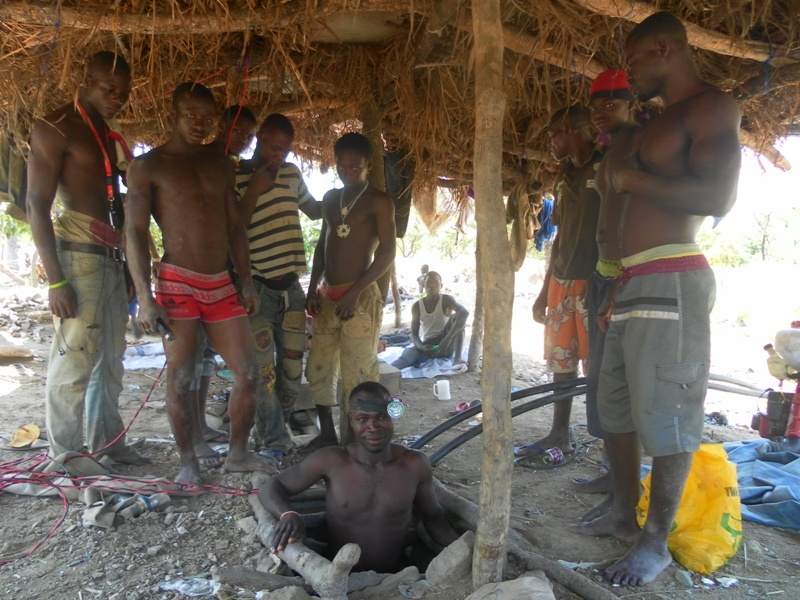 Long before you reach this hub of illegal mining, you will find other villages with their own little operation. Anywhere there is water and enough people to do the work, you can mine. 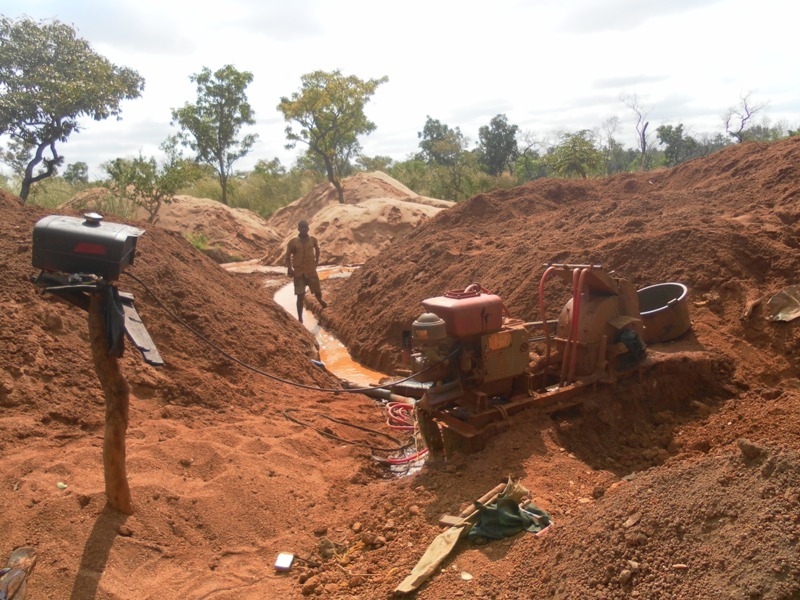 Most operations have pumps to pull water from local streams and machines to separate the gold deposits from the sand, as seen below. The town itself is sprawling. The main streets have shops just like any other town, but the ‘houses’ you find behind them are far different than any you would find near a main road. They are made from the most basic of materials. Four posts and some black plastic is all that’s used to make a room for oneself. There is an ocean of these structures, repeating again and again, as far as the eye can see. You may find a few wooden homes also scattered about; these are the property of the mine operators. Traveling along the dirt roads that branch out of town, you will see many, many operations running and many sites that were are temporarily abandoned until water comes back. It is difficult to find the population of this area, but I’ve heard estimates from five to seven to 10 thousand. I think the middle number is probably a good average. During the rainy season, when water is more readily available, I’m the numbers will climb higher than what I’ve seen. Due to limited time, I was unable to understand the complete working of a surface mine, but one can see from the photos that there aren’t too many steps involved. You simply excavate the soil by hand, have women carry it to the machines, and let them find the gold. Inside the machine you have a filter to catch large deposits. Then on the outflow, you have blue carpet-like fabric to catch any smaller pieces. 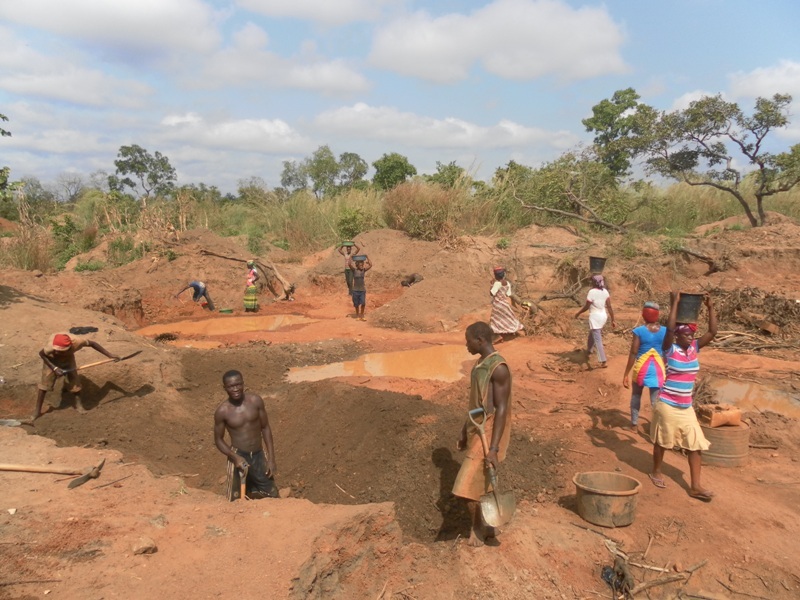 One of the major issues facing galamsey is the use of child labor. Women are tasked with doing the heavy work and sadly, girls in their early teens are forced into this type of work to provide for their family back home. Most workers, both old and young, male and female, have come from far. They come from other regions – Wa, Kumasi, or Bolgatanga – or even from other countries – Ivory Coast, Burkina, Mali – to this land of easy money. For 8 hours of work, men can earn 10 cedis per day, while women can make six. One can only hope that these figures are accurate, as they were sourced from an owner. Most likely, child labor will come at a discount. I visited one mine owner who was happy to show me his bounty. 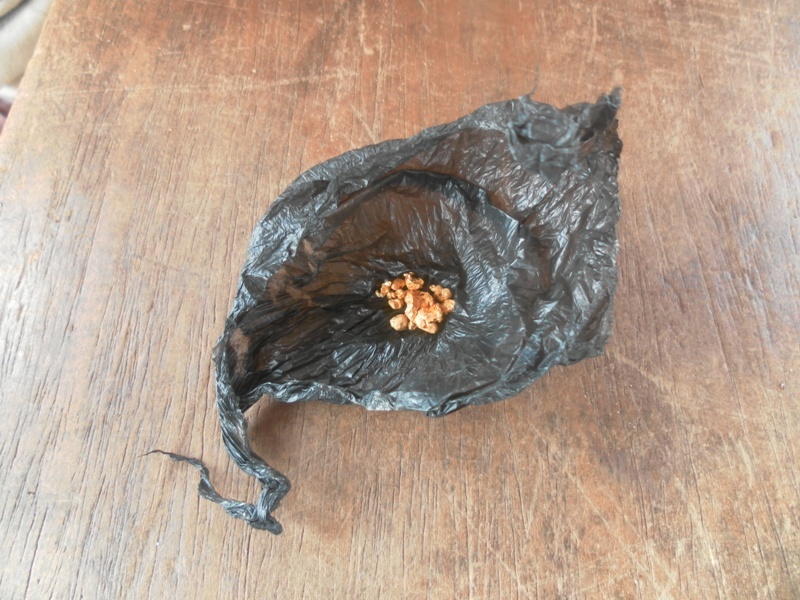 The amount of gold he handed to me, wrapped tightly in an ordinary black, plastic bag is not quite a day’s result. To estimate his revenue was slightly taxing. A “blade” (or a straight razor blade) worth of gold would be 0.8 grams and would fetch GHC 60.50. As he stated that his operation would produce more the one blade per day, it would be safe to assume that each mine owner is generating a substantial salary for themselves. 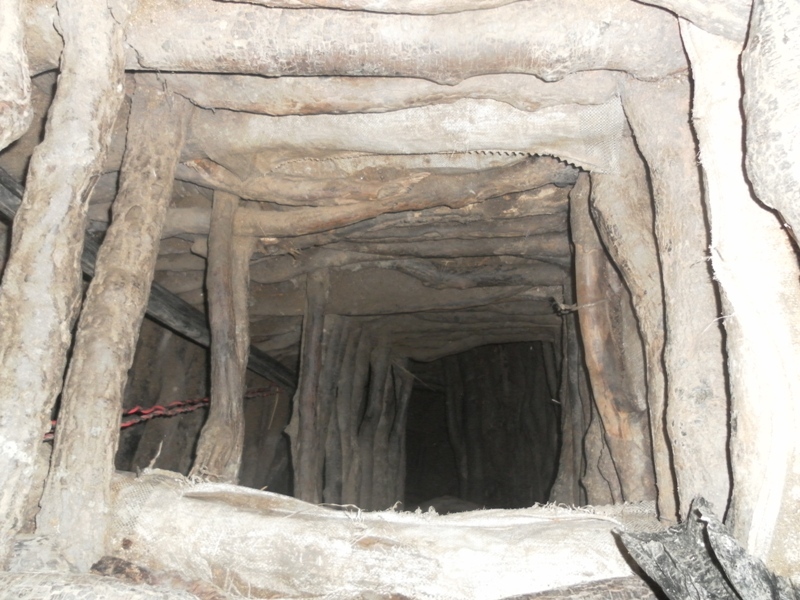 The second form of mining I visited involves underground excavation. I visited two separate operations. The first was very basic, involving a few men and a pit about 20 feet (6 meters) deep. They used a rope and holes cut into the slippery, mud walls to reach the bottom. The bottom was difficult to see and was only truly understand when a worker flashed his light upwards. I was strictly forbidden from going down, although my curious nature wanted to try. The next underground mine I visited was far more industrial. There was far more workers, plenty of holes, and pumps for draining water. As the hole seen below was said to be four poles deep (using electrical poles, as a measuring stick), it could easily be operating below the water table. The men would drain the work zone, arrive at the base, and then travel horizontally, chipping at the bedrock, lifting these chippings to surface level, and then using additional machines to remove any gold. Although there is a ladder to maneuver downwards, it still takes each worker three minutes to reach the base. The town itself is starting to become more of a community than just another transient location, abandoned when there is no more work. They have constructed the first mosque. And some shops are starting to change the materials they build with, from wood to cement blocks. Although people work tirelessly, they are given Monday off to rest and rejoice. One component of life here that I could only confirm from reading between the lines is prostitution and more worryingly, child prostitution. In the bars, you will find men and women joking in a way not normally seen in other towns. They will ask about what type of business the women are in and some will reply that they “sell tea”. When preparing to depart, a man might point at a women in the distance and say something like “would you like to meet her”, followed by laughing with his friends. In this land without law, prostitution is a naturally fit, but when children are involved it shouldn’t be tolerated. Just as people from afar come for the quick money, parents send their children here or children even come by their own will, encouraged by their so-called guardians, not knowing the horrible fate that they will meet. Although there isn’t any government infrastructure in place yet, private enterprise has been able to fill the void somewhat. 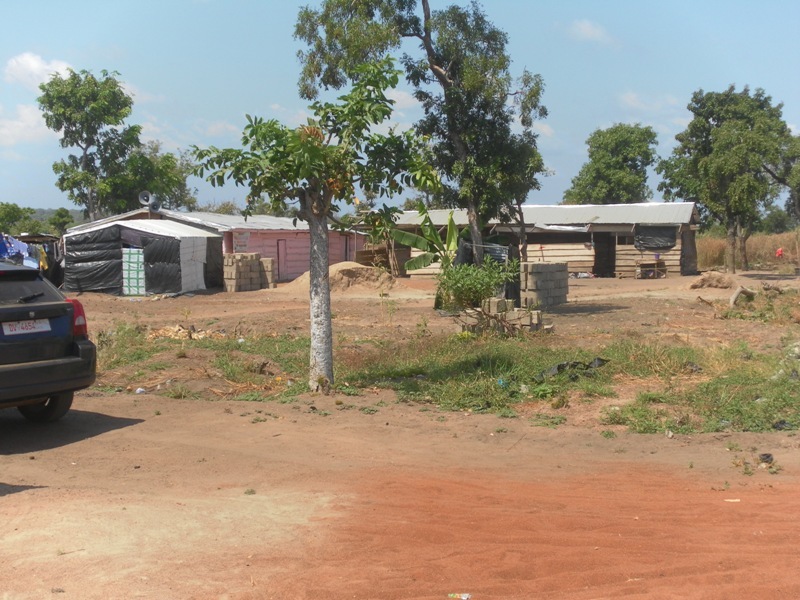 There are two private schools (like the one to the right of the photo below, next to its affiliated church), three private health clinics, and six private boreholes (which provide sachet water for purchase). These services are easily less than what a fully functional town demands and they are also at a cost that some residents may be unable to purchase. Things are at least looking a little brighter for Kui. The Annual Action Plan (AAP) for 2013 lists a CHPS (Community-based Health Planning and Services) Compound designated for the town. Unfortunately, this is just a plan, which may or may not happen due to funding. In the end, we can be guaranteed of one thing – the present. Little access to education, little access to health care, limited water, no sanitation, unsafe working conditions, no law enforcement, and everything else that coincides with an overabundance of wealth for a few, but no social services for the many. Local and national governments need to investigate these areas, rather than complain about the terrible journey the road creates. These are places of immense sadness, which is only made worse when ignored by the public officials charged with protecting basic human rights. Let’s hope they open their eyes.